Note: After highs reaching 60 degrees Sunday and Monday, temps here are expected to take a nosedive by the weekend … down to the 20s and low 30s. Brrr! Hope this little flower finds a way to survive an Illinois winter. 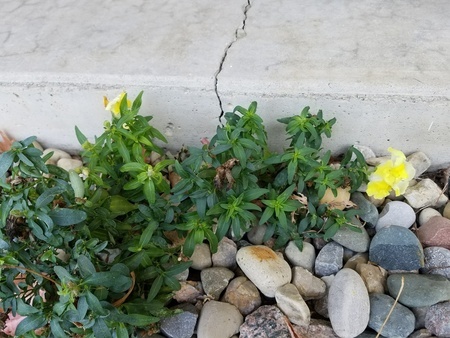 This entry was posted in Seasonal and tagged Haiku, snapdragon, winter nears. Bookmark the permalink. Oh, little flower, take shelter! Put on a little scarf and hat. Lucy, I’m half tempted to dig this little fellow up, repot him, and bring him indoors! Aw, thanks, Lucy. Getting under all those rocks will be a challenge! Well, there is this: here in my area, snapdragons are being planted now as winter flowers. They’ll thrive into the 40s and even mid-thirties, and they can take a little frost. Whether they can take an Illinois winter is something else — but with a mild winter, it just might do it! My aunt on the Gulf Coast recently planted dozens of pansies for the wintertime; of course, their winter is way milder than what we typically get! And everybody says we’re due a really harsh one this year. Sigh. Debbie, hasn’t the weather been so bipolar? One day it’s warm and humid, the next it’s windy and cold. The poor flowers don’t know what to do. Last week while walking through a park I saw roses in full bloom, as if it were Spring. However, the past several days it’s been feeling more like Winter, which I really don’t mind because it feels more like Christmas. I know I’m weird, but I actually enjoy the cold of Winter. In fact, I can’t wait for our first snowfall! Have a super week, my friend! Lovely Haiku and photograph! I know you’re a SNOW-lover, but I only love the first snow of the season — and ideally, I like it to fall on Christmas Eve. Not asking for much, am I?! After everybody has enjoyed its beauty, it all turns to muddy slush and can go away. Yes, I guess I lived in the South too long. You too, Morgan? Last year I covered my Hydrangea with one of those Styrofoam cones, but it didn’t seem to help — and last year wasn’t a hard winter. I didn’t plant this Snapdragon, so who knows how it got there or if it will survive? I thought those things were annuals. I think it had better! We’re expecting heavy rains, wind, and thunderstorms tonight to usher in a cold front. Then temperatures will hover around the 32 degrees point. Brrr, time to bring out my wooly hat and mittens!! Amen, John! Lucy suggested a little scarf and hat. Maybe a pillowcase would work! ha ha ha. Or a quick transplant to an inside pot. Might work, might not. They’re supposed to be annuals. Could be worth a try (nothing ventured, nothing gained, you know). Love snapdragons. Haven’t planted any in a long time. Maybe this spring. I usually have them in hanging baskets and they do well. This poor little guy must have been planted from seed by our birds! Aren’t they though? It got down to the 20s last night (brrr! ), and I’m half-afraid of going outside to check on them now! Crazy weather patterns are similar in Europe. No one knows what season is it from one day to the next. It’s really odd and hard to get used to. One day we’re wearing shorts; the next, heavy coats. No wonder so many folks are sick!